I'm on my way south again to the Polar Technology Conference in Albequerque, NM. This is a very small conference to bring together scientists and providers of technology together. Based on the agenda, I'm sure I'll learn lots. 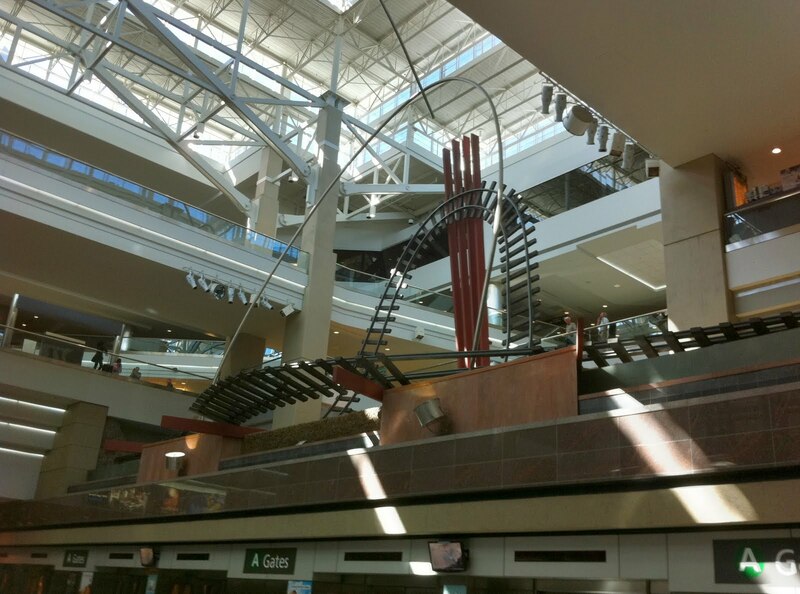 The first picture is inside the Denver International Airport. I don't get here too often and I saw a bit more of it than I usually do. The track really caught my attention as it reminded me of some sort of amusement park ride. This is the third airport of the day that I've needed to wait around in. At least there's free wi-fi. There were some great views of the mountains south of Denver on the flint out but the plane windows were really dirty. This area looks like a great place to ride. 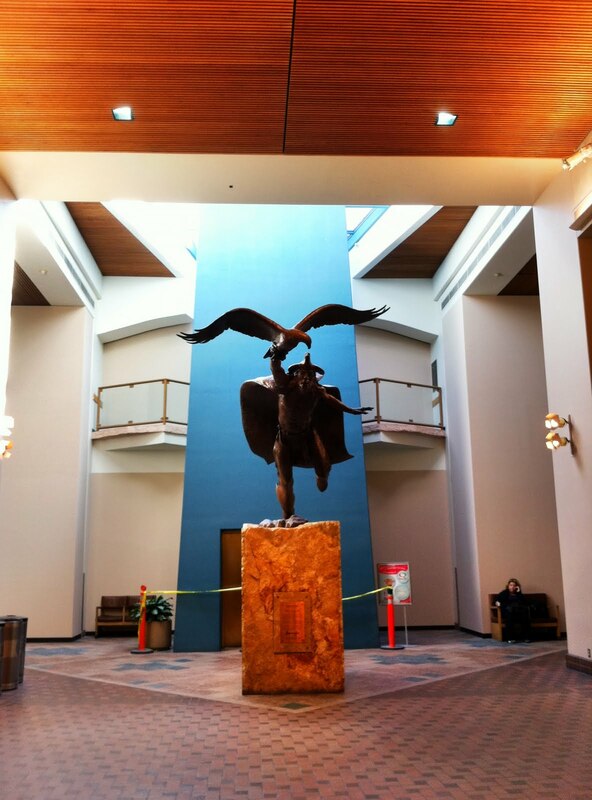 This statue is in the Albequerque airport and must mean something though I don't understand the significance to the airport or the city. Both of these pictures were made using an iPhone app called Pro HDR. I like the results better than the built in camera app and doesn't have the weird, unnatural colors that are sometimes identified with HDR. Interesting pics. You never know what you'll see in an airport. Safe travels to you and hopefully warm weather ahead. Yeah, that Pro Hdr app is nice. The pictures are clear with good contrast. Sounds like you could've met Steve (Scooter in the Sticks) at the Denver Airport. Safe travels! Away from the snow! You should go rent a bike...get in some practice for when the riding season returns up north. I'd use any excuse to justify a ride! Is the track a sculpture? It's interesting, whatever it is. Two post now that I've seen with iphone pics. They take pretty nice photos. Nice use of the HDR, very natural. So Richard, when will you be transiting through DIA or Denver International Airport again and how long a stay will it be? Short stay at DIA this Saturday. In from ABQ at 2:30 and out again to SEA at 5:30. Richard, I'll be at DIA prior to 1pm to drop off Steve of Scooter in the Sticks fame for his flight back to PA....could meet you in the main concourse if you wish, I can't go into the terminals without a ticket. Out of all the airports I had to bounce between over the last three years, Denver is one of my favorites. In fact the Denver area is high on my list as well. Really gorgeous landscape just outside the airport and general area. You are a really dedicated traveller, that's a lot of stops on a trip. I just started using the Pro HDR app a couple of weeks ago. The post processing features are great though, like the built-in camera app you can only use two shots. I wish I had a bit of time to rent a bike and travel around a little. I think I'll end up with some free time on Saturday morning so I may get a chance to look around a little. I like the way this app does HDR. I've tried a few others but don't really care for the over-saturated look they produce. Just about every flight from Alaska involves a couple of legs. Especially if the destination isn't one of the cities served by Alaska Airlines.